Now you might think the following cosmic event pictured in a DC Horoscope, below, is insignificant and perhaps you're correct. You may also believe that once a new solar eclipse manifests, all previous eclipses are no longer subject to activation, whether the eclipses were Total or not. There we disagree. 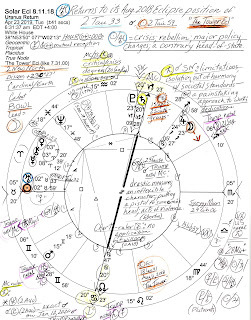 Most of my notes are penned upon the chart so please enlarge the image for better viewing as you wish--although I should point out a few factors: that the transiting Mars-Uranus midpoint sits upon the natal MC of Donald Trump along with enraged star Algol of Medusa fame and this suggests that any, all, or none of the potentials you see penned inside the horoscope may express--plus, transit Mars will soon hit Trump's natal Uranus (17Gemini) in his 10th house of Career and Public Status and this will activate what could be an especially explosive or dangerous period for him; also note that chart-ruler Venus makes no application (other than her conjunction with Chiron), and the chart's BOWL shape is led by an 8th house Moon in Sagittarius (Moon = women and children; the public; Sag is the sign of foreigners and immigrants). 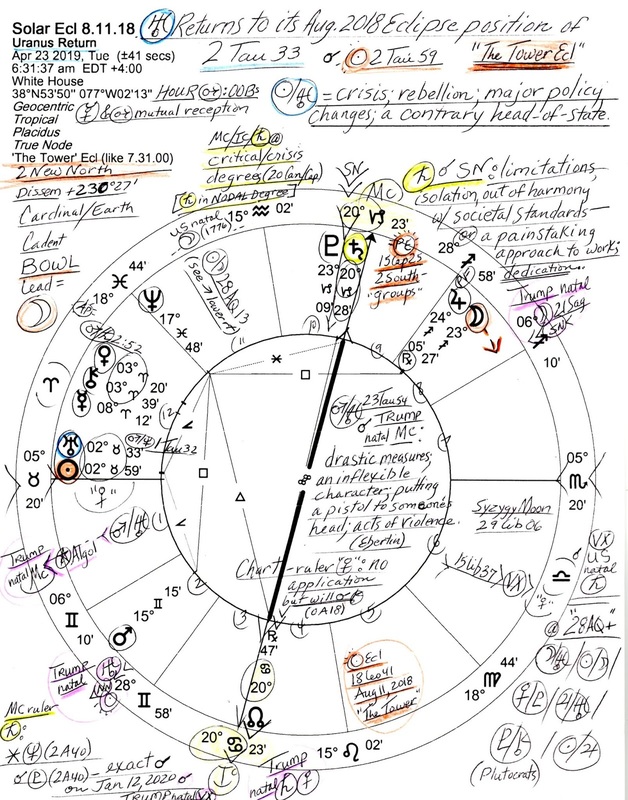 Plus, it's impossible to ignore the cluster f**k at Midheaven with Saturn in Nodal Degree (doubly karmic, or fated) and conjoining South Node, a Saturnian point of separation (see chart notes). Plus, there's power-mad Pluto nearby as the two heavy-weights prepare for their rendezvous on January 12, 2020 @22Cap46 (see link, below) which conjoins the natal Vertex ('VX') of Mr. Trump. Some of Big T's natal placements surround the chart and are highlighted in lavender pink, a perfect shade for cowardly bullies, don't you think? Related: Saturn Conjunct Pluto January 12, 2020 showing the 2020 horoscope, plus, the current Saturn-Pluto Conjunction horoscope, the cycle we remain in (since November 1982) until their next conjunction in Saturn-ruled Capricorn, an Earth sign of government, law, business, and materialism.